We offer a professional service, with No Contract Required. Our rates are lower than average even though we are located in North America. We employ local resident staff to conduct your outbound call center campaign. Benefit from the power of advanced calling technologies, a professionally trained, well-spoken ONSHORE workforce, and over 20 years of experience. Clients outsource their outbound dialing to us because our rates are kept low, to ensure their bottom line.. We help to customize your campaign to ensure higher success with your program. You will receive both positive and negative campaign feedback, from the market place. We will help you interpret current market conditions and other market feedback, so that you can understand the market reactions to your product. This will help you determine what prospective customers want to see from your product or service. This is beneficial to help your customers purchase quicker. We have experienced outbound marketing campaign consultants to give you free advice and best practices to ensure that you succeed, and return again as a happy customer. We want to prove to you that outsourcing your outbound call center campaign to us, works. We want your business to succeed, and our partnership to remain. Live Staff: At Voicelogic, we will always have a live person here to answer your call, to service your needs, or to assist with your campaign. We are open from 7 am to 11 pm each day, where you may speak live to your campaign representative, accounting dept, or to the operations center, to help you with your campaign. We encourage you to visit our 8,000 sq ft facility, including the company owned building we occupy. All work is performed from our fully managed facility, owned and operated by Voicelogic. Free programming. We do not charge any programming fees, while other competitors usually charge high programming fees. We have programmers in-house on staff, every day to help you, with your live call center campaign. Free list scrubbing against your negative file or a do-not-call file, to ensure your call center campaign runs smooth, without complaints. Free help with your script. All campaign conversations are recorded for quality assurance. Free daily consultation and techniques for campaign success, and adjustments of your script. Free daily reports charting your progress. Free list dedupping, or removing duplicate records, so your campaign can run smoother. Free lead tracking for you to see who is clicking on your own website. Use our free lead tracker service “Leadlocater.com”. reports with the exact outcome of every call. We take responsibility for your outsourced campaign. 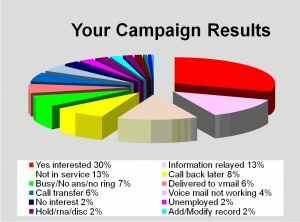 Your campaign will have a 100% delivery rate on every call.. We speak to a live person, or we deliver a canned voice message into voicemail, with your voice. Your campaign will start within 48 hours, or same day, depending on resource staff. All operators are located in North America, and speak with neutral English accent. You can start & stop your campaign to adjust your script for optimum results. We give you free feedback or consultation, on how best to optimize your script. All our software is built in-house and is adjustable to your specific campaign needs. Need assistance with your sales script?, just ask, its free. Our rates can be on a per call basis; you’ll know in advance what your campaign will cost. You may also choose per-hour billing, instead. Your metrics report will indicate the outcome of every call. Calls are categorized by type, and accompanied with an overview chart as seen above. You’ll be on-top of your outbound campaign with progress reports and daily management.. You can receive your leads immediately as they are discovered; to greater increase your chance of closing. This is called Electronic Lead Transfer. Before you select your Outbound Call Center service provider, you need a quote from us. “It has been a great experience, different from any other company that we used before, first and most important the customer service, second your availability to speak and deal with us and resolve every request and issue that arises. The detail of reports are very complete and helpful.